For military occupation, see Military occupation. Occupied (Original Norwegian title: Okkupert) is a Norwegian political thriller TV series that premiered on TV2 on 5 October 2015. Based on an original idea by Jo Nesbø, the series is directed by Erik Skjoldbjærg. Season 2 premiered on 10 October 2017. With a budget of 90 million kr (US$11 million), the series is the most expensive Norwegian production to date and has been sold to the UK, Germany, France, Sweden, Denmark, Finland, Iceland, Serbia, Estonia, Poland, Czech Republic, Belgium, the Netherlands, Luxembourg, Spain, and Portugal. It is also streamed by Netflix in the United States, Australia, New Zealand, Israel, Ireland, the United Kingdom, India, Canada, Belgium, Italy and the Netherlands. The series depicts a fictional near future in which Russia, with support from the European Union, occupies Norway to restore its oil and gas production, in response to a Europe-wide energy crisis caused by the coming to power of Norway's Green Party, which stopped the country's oil and gas production. The series has been renewed for a third season. In the near future, Middle East turmoil compromises oil production. The United States achieves energy independence and subsequently withdraws from NATO, causing an energy crisis. A catastrophic hurricane fueled by climate change, Hurricane Maria, devastates Norway, killing 700-800 people and causing untold physical and economic damage. The resulting chaos leads to the unprecedented rise of the Norwegian Green Party to power in response. The new Prime Minister of Norway, Green Party leader Jesper Berg, is an idealistic politician with bold plans for thorium-based nuclear power as a viable solution to replace oil, which could help avoid further emission of carbon dioxide into the atmosphere causing global warming and climate change. To this end, he cuts off all fossil fuel production, intensifying the energy crisis in the continent. The European Union, in desperation, acquiesces to a Russia velvet glove invasion of Norway. At the inauguration of a thorium plant, Russian special forces kidnap Berg in front of his Norwegian Police Security Service (PST) bodyguard Hans Martin Djupvik and newspaper reporter Thomas Eriksen, and fly him by helicopter to a forest. There, via video chat, EU Commissioner Pierre Anselme demands that he submit to the demands of the EU or face a full-scale Russian invasion. Berg refuses and attempts to escape when he sees a random civilian approach the helicopter. The soldiers promptly execute the civilian, forcing Berg to submit, reasoning that nobody deserves to die. Berg is released and is picked up by Djupvik. To conceal the nature of the occupation, Berg spins the occupation as an "energy partnership", and promises the Norwegian people in an interview with Eriksen that the occupation would be a temporary measure until Norway's oil and gas production is restored by Russian working crews. This intention unravels as a series of events complicates Norwegian–Russian interactions over the ensuing months. The escalation begins when Stefan Christensen, a member of the Royal Guard, unsuccessfully attempts to assassinate the Russian ambassador, Irina Sidorova, only to be thwarted by Djupvik and the PST. The Norwegian military unit seizes two Russian officials who had been urging the Commander of the Royal Guard, Harald Vold, to surrender himself to the Russian authorities on suspicion of hatching the plot to assassinate Sidorova, inciting a hostage situation with the demands being the release of the attempted assassin from the Russian embassy, located just across the street from a restaurant frequented by Russians since the occupation began, run by Eriksen's wife Bente Norum. Peter Eriksen, Eriksen's son and Norum's stepson, joins protests against the Russians, and soon becomes involved with anti-Russian radicals. When a Russian agent is the victim of a hit-and-run in front of the embassy and restaurant, the Russian government demands that Norway extrajudicially extradite the driver, a suspected Chechen terrorist named Elbek Musajev. The hit-and-run was an accident caused by his son Iljas rather than a deliberate attack, but Elbek commits suicide to avoid being deported to Russia. An insurgent group, Free Norway (Fritt Norge), emerges, led by Christensen, Vold, nationalist academic Eivind Birkeland and Iljas Musajev, and attacks police headquarters, injuring a teenager who had been detained for posting anti-Russian messages inciting opposition to the occupation. The Russian government takes this as an excuse to prolong their occupation of Norway. A gas production facility is attacked, temporarily delaying the EU production target, and killing many Russian workers, further delaying the pullout. Tensions further increase as suspicious events occur at the Norwegian–Russian border, where Russian troops infiltrate Lapland (Finnmark County), Eriksen is murdered while investigating the Russians, and a Russian naval fleet starts exercises off the coast of northern Norway. Berg asks the EU to protect Norway's sovereignty, but the EU fails to act decisively. Free Norway receives assistance from inside the PST by its chief Wenche Arnesen, who chose to defect after discovering that she is terminally ill. The group begins a recruitment drive of retired military personnel and prisoners. Berg has in the meantime set up an caretaker government under the orders of the King of Norway after losing a no-confidence motion by the Green Party, and had known Russian sleeper agents sent to internment on Svalbard; however the transfer is pursued by Russian fighter jets, forcing it to turn back. In light of this internment campaign, Russian "terrorists" seemingly armed with suicide vests storm Berg's office and hold him hostage. Berg is rescued and evacuated to the residence of the U.S. ambassador, setting up a government in internal exile. It emerges that the oil refinery attack was actually a false-flag attack staged by the Russians. When Norum's daughter, Maja Norum, discovers that the Russians killed Eriksen, Norum expels Russian staff members from her restaurant, and provides information to Free Norway. Berg, taking sanctuary in the U.S. ambassador's residence, takes every opportunity to attempt to engage the United States in a series of Norwegian moves to try to dislodge the Russians, but the U.S. refuses direct involvement in any conflict they have a risk of losing. Events spiral further when after calling the public to resist the Russians, Free Norway kidnaps Sidorova and one of her bodyguards, executing the latter live over the internet; in response, Russian special forces seize Oslo Airport. Berg's pressure on the U.S. prompts the ambassador to poison his food and Berg is admitted to a hospital where he is captured yet again, this time by Free Norway, who also assassinate a high-ranking Russian general along with several Russian soldiers in front of the Russian embassy, using Norum's information (incurring a rebuke from her lover, a Russian agent named Nikolai). After being rescued, Sidorova calls Djupvik and tells him that Russia is now at war with Norway. Arnesen records and releases a video revealing her defection. She later commits suicide at a church to avoid capture, and its priest cremates her body. Berg is taken to a Free Norway resistance camp, and is asked by Vold if he is ready to fight for his country. After being kidnapped, Berg is proclaimed as the new leader of Free Norway, and the group carries out a guerrilla campaign against the occupation, attacking both Russian and Norwegian forces and staging terror attacks throughout the country, nearly plummeting the country into a civil war. Six months later, however, the insurgents have lost much of their strength due to Russian military and Norwegian police action. Berg is thus sent into exile in neighboring Sweden, which had supported the initial Russian invasion as a member of the EU. Berg's replacement as prime minister, fellow Green Party member Anders Knudsen, proves unable to handle the pressure and resigns. Following his exile to Sweden, Berg attempts to form a parallel government-in-exile. While acting as a go-between Berg and the leaders of Storting, his political adviser and lover Anita Rygh sees her political role marginalized. Rygh instead recommends to the majority party that they form a new government. The president of the Storting refuses, but offers her the prime ministerial position. She accepts, severing her ties with Berg. A Norwegian Coast Guard officer approaches Berg with news that the Russians are installing cruise missile launchers on the oil installation of Melkøya in northern Norway. From his position in Sweden, Berg contacts the insurgents and orders them to get photographic evidence. A platoon of guardsmen independently confronts members of a Russian private military company stationed there under the guise of an inspection. One of the guardsmen, a naturalized Somali immigrant named Faisal Abdi, transmits a video of the missiles, but a gunfight breaks out and the guardsmen are captured and brought to a Russian prison. The leader of the expedition dies after being hit by gunfire. The return of the soldiers becomes a source of tension between the nations and Rygh's first true test. Djupvik, now head of the PST, continues to walk a line between allegiances. Unable to track down Arnesen, he strong-arms the priest at the church where she died into admitting she has been dead the whole time. The Norwegian police capture Vold in an operation. The Security Service discovers Berg is using a video game to communicate with the rebels, and when they find proof that he ordered the illegal mission to Melkøya, he is ordered to be arrested. Tipped off, Berg flees in the night, and emerges in Poland, where he meets a reporter from Germany's Stern magazine and leaks government documents, before fleeing to Belgium and then France, where he is arrested at the request of Russia. He pursues a case in the European Court of Human Rights, claiming that his life would be at risk if he was extradited. The court agrees, and orders Berg’s release. As the Russians are unwilling to free the guardsmen captured, Djupvik's wife Hilde drafts a plan to have them tried in Norway but with a Russian lay judge presiding over the trial. The Russians agree and all of the soldiers are found guilty. A group of civilian government opponents, Free Our Soldiers (FOS), is created by Faisal's girlfriend, Frida Engø, and her hacker friend Leon Tangen to peacefully force the government to pardon them. Christensen, one of the leaders of Free Norway who had incited the crisis with his attack on Ambassador Sidorova, becomes a lone-actor, kidnaps Djupvik's daughter and demands the soldiers be set free, prompting condemnation from FOS. Christensen is tracked down by the Russians and Djupvik's daughter is saved. The Russians allow him a chance to talk to Christensen. When Christensen says he regrets not killing the child, Djupvik shoots him. Rygh offers the rebels amnesty in return of their turning in their weapons, which is endorsed by Vold and the Russians. The government then releases the guardsmen. Vold then forms a new political party to succeed Free Norway, the Liberation Party. Rygh's mother, once an ardent supporter of her daughter, becomes despondent at how much Norway has lost. Meanwhile, EU Commissioner Anselme is succeeded by a Polish politician who is more sympathetic to Berg and his cause. Throughout the season, Bente Norum has opened a hotel with a Russian business partner named Zoya. As with her previous restaurant, this venue proves to be a real hit among Russians and it is a profitable venture. A powerful Russian, Konstantin Minnikov, stays at the hotel. Norum is approached by a Free Norway agent, Anette Kleven, to use a device to mirror Minnikov's phone. She declines, until she discovers that Minnikov is secretly buying out her partner. Minnikov's daughter Nadia replaces Zoya as Norum's business partner, and befriends Norum's daughter Maja. Minnikov finds out Norum has been spying on him, and he confronts her. She accidentally kills him during the confrontation. Afraid, she calls Nikolai who disposes of Minnikov's body. The rebels use this to blackmail her to spy on other Russians who are guests at her hotel. She keeps this a secret, and Zoya is blamed for the murder. When Norum discovers this, she goes to the police to turn herself in, only to find out that resistance fighters won’t let her confess. She meets Djupvik, and gives him information on the activities of the rebels. After being released, Berg sets off to return to Norway by sea, with a group of European politicians to support him and serve as protection. However, the European politicians are forced to leave after the Norwegian government threatens gas supplies to Europe. In response, Berg recruits Tangen to hack a Russian missile system and shoot down a Finnish fighter jet in a false-flag attack, causing the EU to rebuke Russia. Tangen is killed by a Russian hit squad in retaliation for his role, but is able to pass proof of Berg's involvement to Engø beforehand. When Rygh orders the Norwegian Navy to detain Berg, they refuse, igniting a military coup led by Vold. Djupvik's wife leaves him over his involvement with the Russians, and Norum sells her hotel to Nadia, allowing her and Maja to leave Norway and emigrate to Russia. To contain the situation, Rygh and Djupvik spin the coup as a restoration of order (which marginalizes Vold), and decide to accompany Berg to Norwegian shores, where he is met by an adoring crowd. Berg proclaims Rygh as his official successor, and she announces the end of the Russian occupation. However, she is shot by Abdi, who had become radicalized by Tangen's death (egged on by Vold, who watched from the sidelines). Later that night, Berg returns to the office of the prime minister and sits in the prime minister's seat, facing an uncertain future. Jo Nesbø wrote the first episodes in 2008, and the series, planned to be produced for Norwegian Broadcasting Corporation, received a NOK 9.7 million production grant from the Norwegian Film Institute in April 2013. After four years of planning, disagreements over the progress led NRK to withdraw from the project; TV2 took over in October 2013. The series premiered in Norway on TV2, on 5 October 2015, and in the United Kingdom and Ireland on 13 January 2016 on Sky Arts in HD. The series was added to the Netflix streaming service, in multiple countries, as of 20 January 2016. The series premiered on Pivot TV in the United States on 5 May 2016 and on the Canadian public television station TVOntario on 11 September 2016. In Poland, the series broadcasts on Ale Kino+. The Daily Telegraph's cultural reviewer Gerard O'Donovan wrote of Occupied that the series' innovation more than made up for any lack of plausibility, citing the interesting historical, geopolitical interplay between Norway and Russia as fascinating. O'Donovan went on to praise the first episode, saying, "the tense plotting and a pace sufficiently frenetic to carry all but the most curmudgeonly along." It is certainly a shame that, in the year of the 70th anniversary of the victory in World War II, the authors have seemingly forgotten the Soviet Army's heroic contribution to the liberation of northern Norway from Nazi occupiers, decided, in the worst traditions of the Cold War, to scare Norwegian spectators with the nonexistent threat from the east. The Russian embassy had been informed in an early stage of the work on the series. ^ "Trier, Ohlin, Ambo Films, Flagship TV Dramas Receive Funding". Nordisk Film & TV Fond. 9 May 2014. Retrieved 6 September 2015. ^ Elsa Keslassy (7 April 2015). "Mip TV: Zodiak Greenlights Scandi Political Thriller Occupied". Variety. ^ Scott Roxborough (8 April 2014). "MIPTV: Yellow Bird Begins Shoot on Jo Nesbo Series Occupied". The Hollywood Reporter. ^ Stø, Steffen (18 August 2015). "Se første traileren til TV2-serien Okkupert". Serie Nytt. Retrieved 6 September 2015. ^ a b "Nesbø-serie om russisk okkupasjon". NRK. 25 April 2013. Retrieved 6 September 2015. ^ Vestrheim, Emma (13 February 2017). "Occupied Season 2 Release Date Revealed". Cinema Scandinavia. Retrieved 7 July 2017. ^ Nordseth, Pål (18 August 2015). "Den har kostet 90 millioner og er TV 2s store seriesatsing i høst: Se traileren til Okkupert her". Dagbladet (in Norwegian). Retrieved 6 September 2015. ^ Tjernshaugen, Karen (29 August 2015). "Russland fordømmer ny norsk TV-serie". Aftenposten (in Norwegian). Retrieved 6 September 2015. ^ @whatsonetflixau (21 January 2016). "New to Netflix Australia is "Occupied" a Norwegian thriller where Norway is occupied by Russia" (Tweet) – via Twitter. ^ a b Brown, Jacob (29 January 2016). "On Netflix: Occupied is the New Homeland". Vogue. ^ "Norway Occupation TV show irks Moscow". The Local. 12 February 2014. Retrieved 6 September 2015. ^ Vestrheim, Emma. 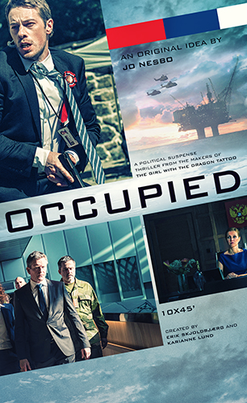 "A third season of OCCUPIED has been confirmed – Cinema Scandinavia". Cinema Scandinavia. Retrieved 30 September 2018. ^ "Disse får hovedrollen i Nesbø-serien". Side2.no (in Norwegian). 7 April 2014. Retrieved 6 September 2015. ^ Olav Gorseth (10 April 2014). "DNS-skuespiller sentral i Okkupert". Bergens Tidende (in Norwegian). Retrieved 6 September 2015. ^ "NRK dropper Jo Nesbø-storserien Okkupert, TV 2 lurer i kulissene". Filter Film og TV (in Norwegian). 30 October 2013. Retrieved 6 September 2015. ^ Henriksen, Arve (31 January 2014). "NRK trekker frem gamle skjeletter". Aftenposten (in Norwegian). Retrieved 6 September 2015. ^ Whitlock, Jessie (28 September 2015). "Sky Gets Occupied With Scandi Drama". Television Business International. Retrieved 16 January 2016. ^ "Occupied: Season 1 Episode List". TheTVDB.com. Retrieved 8 November 2017. ^ "Occupied - Season 1 Episodes List - Next Episode". Next Episode. Retrieved 8 November 2017. ^ "Occupied: Season 2 Episode List". TheTVDB.com. Retrieved 8 November 2017. ^ "Occupied - Season 2 Episodes List - Next Episode". Next Episode. Retrieved 8 November 2017. ^ O'Donovan, Gerard (13 January 2016). "Occupied, episode one, review: bang on trend". The Daily Telegraph. Retrieved 16 January 2016. ^ Bershidsky, Leonid (2015-08-28). "Norwegian TV taps into fear of Russia". Bloomberg View. Retrieved 2015-09-06. ^ "How Norwegian TV is cashing in on fears of Vladimir Putin's Russia". The Australian Financial Review. 31 August 2015. Retrieved 6 September 2015. ^ "Fictional Russian invasion sparks row with Moscow". The Guardian. 30 August 2015. Retrieved 24 February 2018.